1. Knocked over a cup of water on my craft table. Twice. 2. Unknowingly dropped my Versafine Onyx ink pad on my Score Board. Found out after I ruined a card. 3. Misplaced the huge W R Memory Keepers glass mat that I used 10 minutes ago. Must be somewhere. 4. Due to 1 and 2 and a bunch of stupid stamping ideas, this is the 4th version of this card! Persistence. Fell in love with the new Right at Home set, Thanks a Bunch, as soon as I saw it. I love the font and the cute little sayings. So I bought it. ** Those teeny stars are from a Hero Arts set called Color Layering Ice Cream. Used Hero Arts Strawberry liquid watercolor to make this background. I was lucky and won the entire set of 8 liquid watercolors. Based on very little experience, so far I love these watercolors. They come in a bottle with a dropper. I put one drop on my glass mat (which I now see leaning against a bookcase!) and sprayed a bit of water away from the drop. Mixed with a brush and applied to damp paper (Bristol Vellum). The color went on very easily and, after it dried, the color did not bleed when wet (see knocking over water cup above). Do we NEED these liquid watercolors? No. Are they fun? Yes. By the way, the Bristol Vellum paper buckled a lot. It is not a watercolor paper but it's white and can handle a decent amount of water. Adhered the layer to an A2 card and ran it all through my Big Shot and, voila, a flat card. MOOD WHEN DONE: This card makes me happy. My house is a mess, but my heart is happy. Thank You: Got so many wonderful comments on my first column on the Right at Home blog. I really appreciate every single one. ** Disclosure: Paid full price for the Right at Home set. Hero Arts sent me the ice cream set last year. Love this card, Joan! And CAS is never, ever easy. Often I get it right only after making lots of pretty trash. Thanks for the tip about running warped paper through the die cut machine. Brilliant! 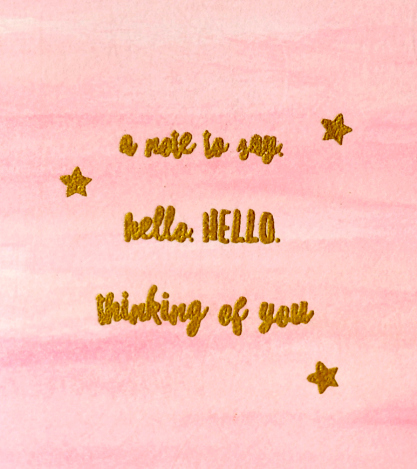 oh this is so pretty with the pinks and gold - lovely! sometime i iron my warped paper between sheets of copy paper and works really well too. haha finding the glass mat is my favorite! This is GORGEOUS - I guess I hadn't tried such a pale wash with those - I love them too. Those are not the most fun kind of stamping adventures, sheesh. I've lost things many times in my room, and have to stop and clean up. Sometimes I find things in the obvious place, sometimes not so obvious. Ultimately you made a pretty card. 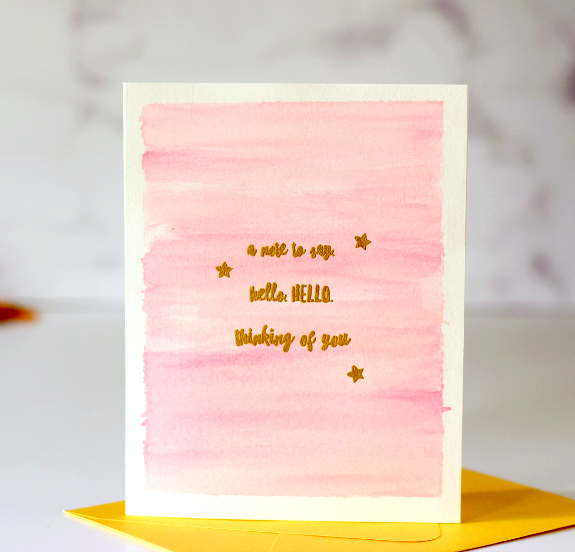 I've always like gold on pink, and even better that it's watercolor. I appreciate your tip about running the card through the Big Shot. Remember reading that here a while back. Tried it and it works! Thanks!